I had so much fun with the original Tonka RC Ricochet that when I saw this little guy at Toys R Us for just $25, buying it was a complete no-brainer. While the original was a huge, transforming monster truck, this is a practically palm-sized mini stunt machine clearly designed to be used in smaller spaces. Like the big one, the Tricksters feature a low-profile design and oversized wheels to allow them to drive even when they're flipped upside-down. Three different designs & color cmbinations are available, and each has a "signature trick," a full stunt it'll perform on its own by holding just one button on the controller. The truck itself does not require any batteries -- it has a rechargeable pack built in. You just supply AA batteries for the controller, which doubles as a charger. Open a concealed compartment on the front of the controller, and you'll find a charge cord that you plug right into the truck to juice it back up when it's running low. Good deal. 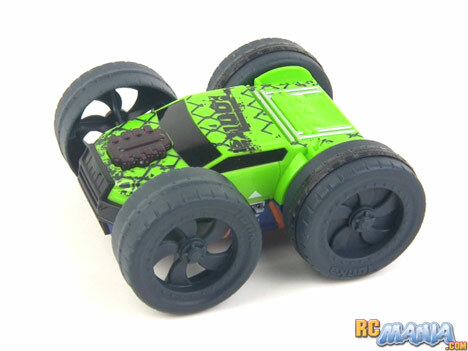 Because of their size and smooth tire design, Tonka Ricochet Tricksters should be run on a fairly flat, somewhat clean surface. Don't get me wrong, though. Concrete & asphalt are no problems, and if you want to set up some small little ramps to jump your truck off of, that's okay too. You just don't want to try running in loose dirt, gravel, sand, or grass, as it's just not made to handle those sorts of terrain. What this truck is made to do, though, as I very quickly discovered, is drive like it's completely insane. It has good speed and it gets to that speed very quickly. With a skid steering setup (left/right driven wheels are powered independently), it can spin ine one place and then come to an immediate stop. When you tell it to turn, it whips around incredibly quickly, usually actually turning farther than you wanted. It's a crazy ball of unbridled energy just waiting to be unleashed any time you touch the controller. Because of this, in the small kitchen where I was running it, I crashed into walls & table or chair legs quite a lot. It really needs a larger space, even though the truck itself is very small. The good news is that no matter how much I beat on it, nothing broke, and in fact I can't see a single scratch on it! The Tonka XT Ricochet Tricksters RC trucks are truly intense. If you want something very controllable that will drive around precisely how you want it to, this is not a truck for you. This is for what hobby-grade RC'ers call true "bashing." Stack up empty aluminum cans and crash through them. Make little jumps and try to land in a flip. Drive onto a pile of plastic building bricks and do a cyclone spin, sending pieces flying everywhere. Blast some music and have some serious fun. For a regular price of $25, not even on sale, with a rechargeable battery included in the truck, this is a sick deal.